Allergies are very common. In fact, around 55 percent of the United States population suffers from one or more allergens. Allergies are a hypersensitive immune response to substances that either enter or come in contact with the body. People who suffer from allergies have an abnormal immune system that reacts to usually harmless substances in the environment. Pollen, mold, and pet dander are called allergens. Not one single allergic reaction is the same—and people experience symptoms in different ways. Below are common allergies people can develop. Seasonal allergies, also known as allergic rhinitis or hay fever, is a definition used to describe a collection of respiratory symptoms that are experienced by people whose immune system creates an allergic reaction to different trees, grasses, and weeds. Seasonal allergies can have an effect on people at different times of the year depending on what triggers their allergic reaction. Many people find the spring time is what commonly starts their symptoms because in early spring, the trees start to bud creating pollination. After the trees are done budding, the grasses begin to pollinate and they generally peak around June. July and mid-August is when weeds begin to pollinate heavily and continue to pollinate until the first frost. Symptoms of seasonal allergies generally include runny nose, nasal congestion, post nasal drip, itchy nose/eyes, watering and tearing of the eyes, and sometimes asthma. At times, people can experience more severe symptoms which include headaches, fatigue, insomnia, and a cloudy mind. Environmental allergies, including pet dander, mold, dust, and dust mites, are a different collection of substances that trigger an allergic reaction. The immune system reacts negatively to these substances (causing an allergic reaction), and attempts to get rid of them. Environmental allergies are hard to identify because they often mimic cold symptoms–so people tend to think that they need to treat their “cold” rather than allergies. However, there are some differences including: drippy nose with watery, clear fluid, itchy eyes, symptoms that last for weeks, chills and body aches, and nasal secretions that are yellow or green in color. Hives, also known as urticaria, are raised, red, itchy skin rashes that are commonly triggered by something that produces an allergic reaction caused by an allergen. Hives often appear when the body releases histamine and other chemicals from under the surface of the skin. The release of these chemicals causes inflammation and fluid to build up under the skin, which develops into hives. Extremes of temperature, sunlight exposure, latex, pet dander, dust mites, medications, infections, and certain foods can cause hives. Swellings (wheals) rise up on the skin as a rash. They are commonly pink or red and have an oval or round shape. The size of these swellings can range from a few millimeters in diameter to several inches, and tend to be extremely itchy. In the majority of cases, hives tend to be present for no more than 8 to 12 hours, and rarely stay for more than 24 hours. However, some people may experience hives for a couple of days to several months. Atopic dermatitis is one of the most common skin conditions, and can affect anyone at any age. Atopic dermatitis, also known as eczema, is a chronic (long-term) skin disorder that involves scaly and itchy rashes and can be accompanied by asthma or hay fever. Atopic dermatitis can affect any region of your skin, but it commonly appears on the arms and behind the knees. It is not known what causes atopic dermatitis, however, researchers suspect that it is most likely due to a combination of dry, irritable skin with a malfunction in the body’s immune system. Experts believe atopic dermatitis can play a role in genetic factors. 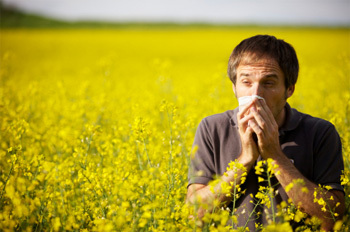 Theories have connected asthma and hay fever with atopic dermatitis, however, not all people with asthma or hay fever develop atopic dermatitis and vice versa. Patches of atopic dermatitis can appear anywhere on the body, but they typically show up on the hands and feet, in front of the bend of the elbow, behind the knees, and on the ankles, wrists, face, neck, and upper chest. Symptoms include: red/pink to brownish-gray colored patches, extreme itching, raised bumps, thick, cracked or scaly skin, and raw, sensitive skin from scratching. Call our office today if you or a loved one is suffering from allergies.